These 6 sunscreens for kids play an important role in keeping your child healthy and safe, but their baby blues need protection, too. Browse Ro·Sham·Bo Baby's selection of children's sunglasses with UV protection to find the perfect pair for Junior, like our sky blue Wayfarer sunglasses! We've all been there: you're headed off to the beach or pool with your kids and what feels like half your home's contents, but when you take a quick look for the sunscreen to coat your kids before heading out the door, you find you're all out. Although there are a number of safe sunscreens for kids and babies out there, many of them are sold online only or in specialty stores that you won't have time to run into with the kids in tow. Not only that, but quite a few of those options are a little pricey. Each sunscreen listed below is marketed for use on babies and kids and considered "safe" thanks to its lack of ingredient hazards as well as its UVB protection, UVA protection, balance of UVA/UVB protection, and sunscreen stability (aka how long it takes for the product to break down in the sun). However, each made the cut on this particular list thanks to its affordability: three of the six picks are under $12, and though the most expensive one on the list is $19, we'll tell you why it might be worth shelling out those few extra dollars below. 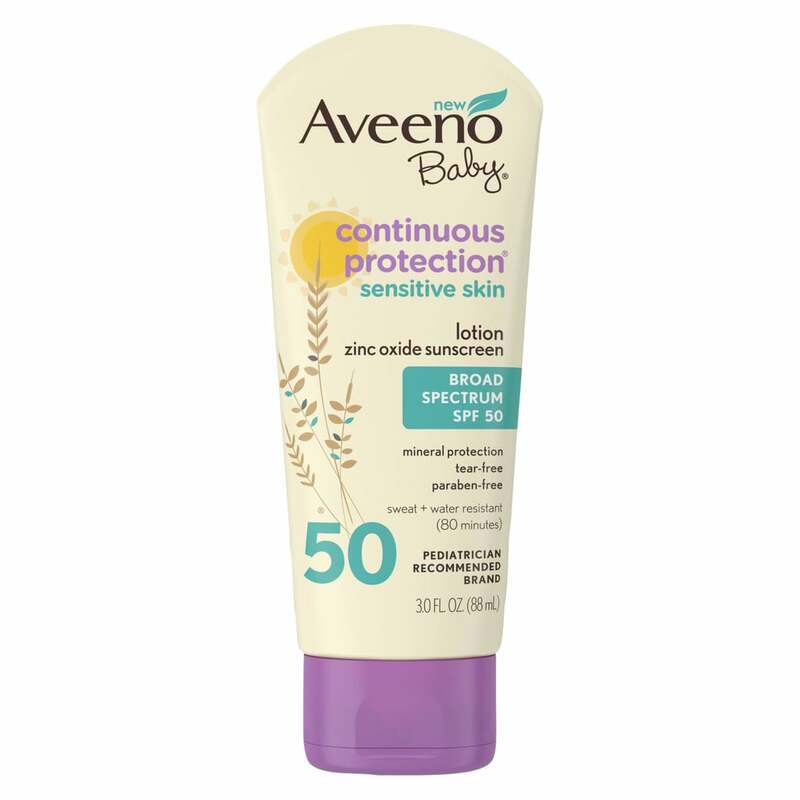 One of the highest-rated drugstore-brand sunscreens on the market, Aveeno Baby Continuous Protection Sensitive Skin Lotion Sunscreen ($10) is a mineral-based sunscreen using both zinc oxide and titanium dioxide to block the sun's rays. Plus, in stick form, it's easy to apply to squirmy tots and fits nicely inside a diaper bag. 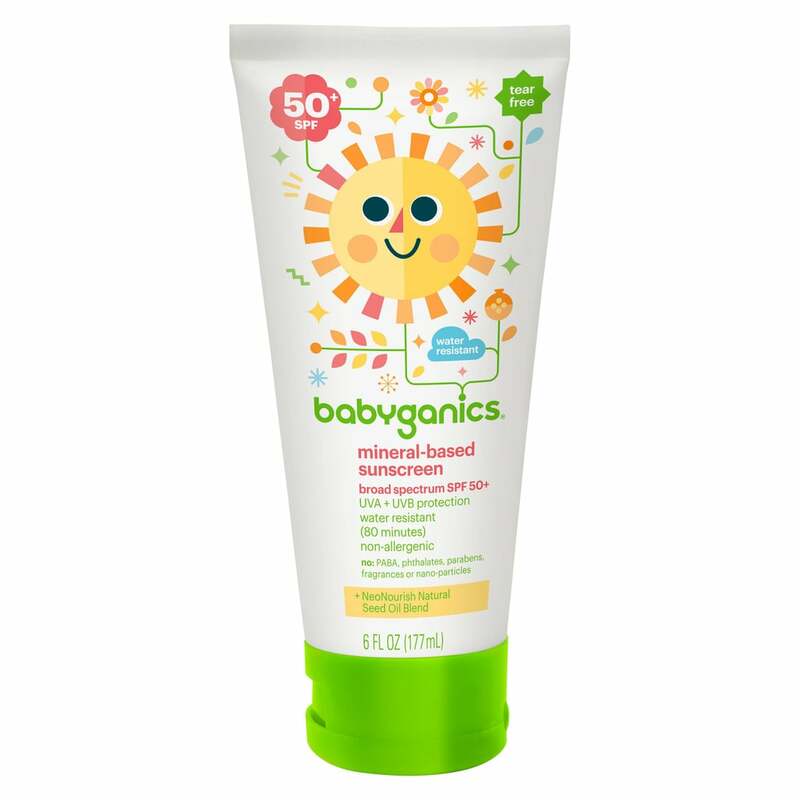 The Babyganics Mineral-Based Sunscreen Lotion, SPF 50+ ($10) was green-lighted by the EWG for its mineral-based formula and broad UVA/UVB protection. It's gentle on the skin and an easy formula to apply to your child's whole body (unless you have a wriggly toddler . . . they make everything more difficult). 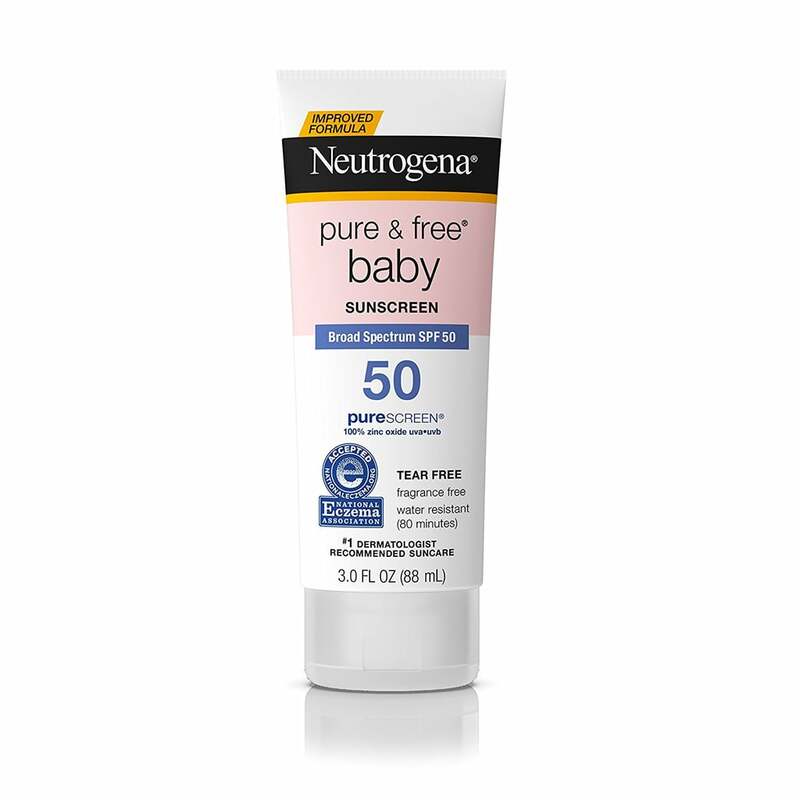 Arguably the most recognizable product on this list, Neutrogena Pure & Free Baby Sunscreen, SPF 50 ($11) can be found on drugstore shelves along with other Neutrogena products. The EWG gave it a high rating in 2017 due to its excellent UVA protection. 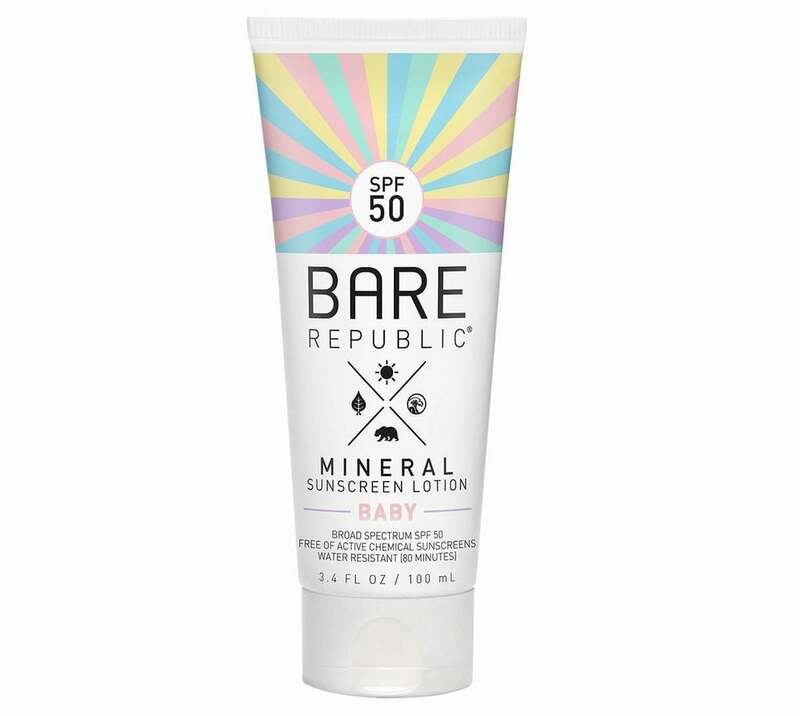 Aside from its pretty rainbow packaging, Bare Republic Baby Mineral Sunscreen Lotion, SPF 50 ($15) has a high EWG rating. It's a zinc-oxide-based product (22 percent) that provides excellent UVA protection and a good balance of UVA protection in relation to the SPF. 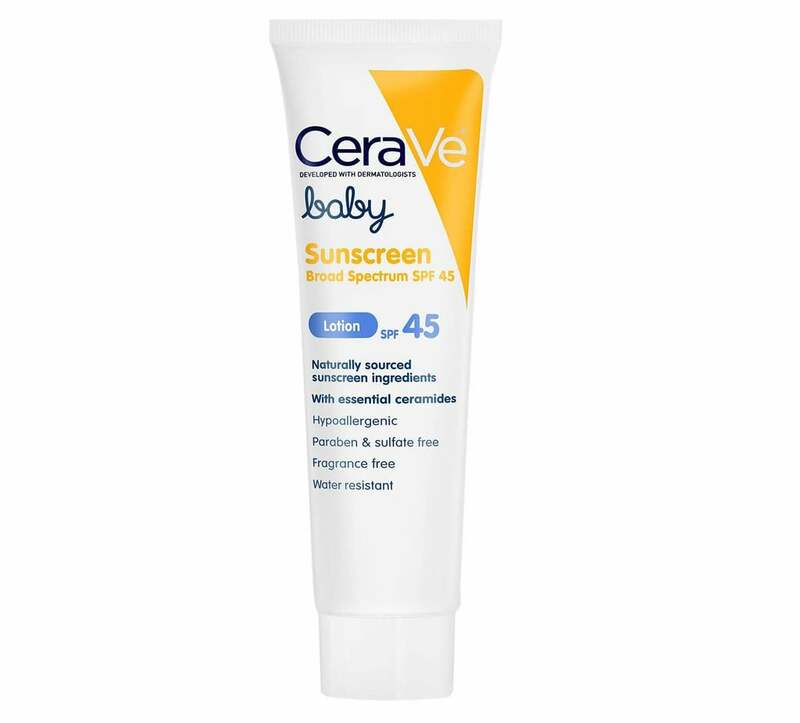 The CeraVe Baby Sunscreen Lotion, SPF 45 ($16) protects from UVA and UVB rays with its mineral-based formula. Blue Lizard's Australian Baby Sunscreen, SPF 30+ ($19) is made specifically for kids' sensitive skin and uses zinc oxide (10 percent) and titanium oxide (five percent) for sun blockage. It received the EWG's good rating for its UVA protection and was listed in its bargain picks despite being nearly $20 . . . but it's arguably worth the few extra dollars because the "smart bottle" turns pink in UV light, alerting you to those pesky rays you can't actually see. Does "vacationing" with your baby sound like an oxymoron? As someone who has ventured on road trips, beach getaways, cruises and more with my two kids, and who is writing a book about family travel—The Travel Mamas' Guide—I know that vacations now are not as easy as they were prebaby. And while there are tons of tips on how to get there, there's not much advice for how to manage once you arrive. A few simple tricks have saved some of my family's trips. Just as important as what you pack—and you can check out get-ready checklists here—in my opinion, is how you unpack. As soon as you arrive (unless someone in the family is overly cranky or tired), set up your room to make it as close to home as possible. Put the baby in the playpen or hotel crib with a pile of toys and occupy an older kid with a coloring book. Or have your partner take the older sibling out to get the lay of the land while you unpack. Settling in will help you remain organized (and sane) throughout your stay. Bring a box of wipes, lay out a changing pad (I like to put a disposable changing pad on top of a hotel towel) and stack a bunch of diapers in one area. That way, you won't need to chase down the diaper bag when that first big poop occurs. Stash toys and books on a low shelf or in a drawer, or keep all the playthings in one corner. Creating a place for your baby to play will make the room feel homey and keep it from looking like a disaster area. Even if your room doesn't have a kitchen or bar area, establish a spot where you'll keep bottles, dishes, baby food, snacks, formula and dish soap. Sometimes the bathroom is best if it has the only sink in the room. When my daughter, Karissa, was a baby, she wouldn't nap in a strange crib while on vacation. 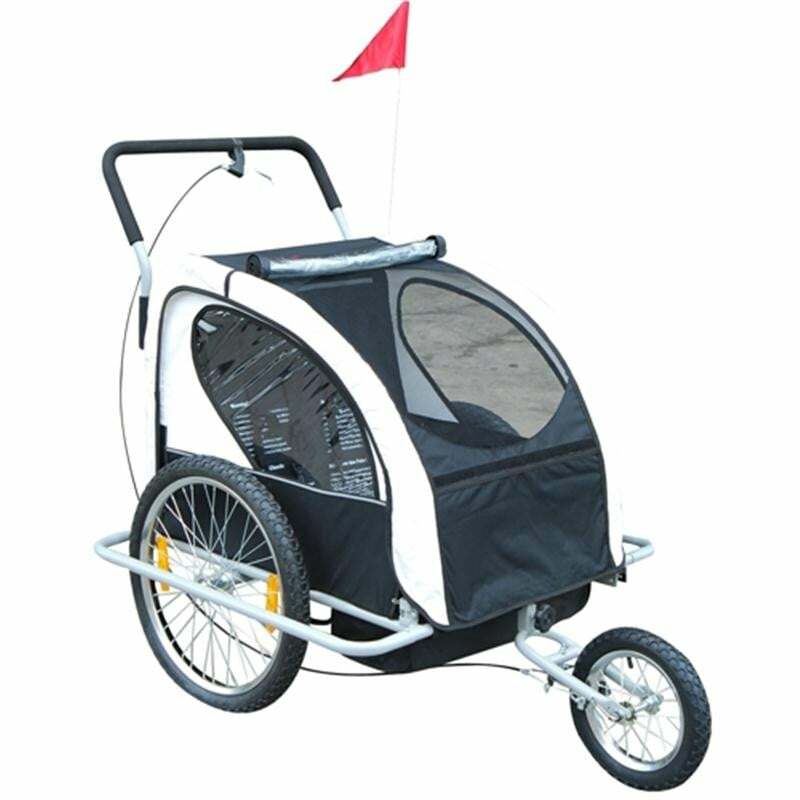 So we planned our days around taking long walks with her napping in a stroller. Some momsadvise bringing the lightest, most compact umbrella stroller on vacation to save room, but I always pack a stroller that reclines completely to make stroller slumber easier. If your baby doesn't sleep well in a stroller, try a front carrier (like the BabyBjorn) or baby backpack. 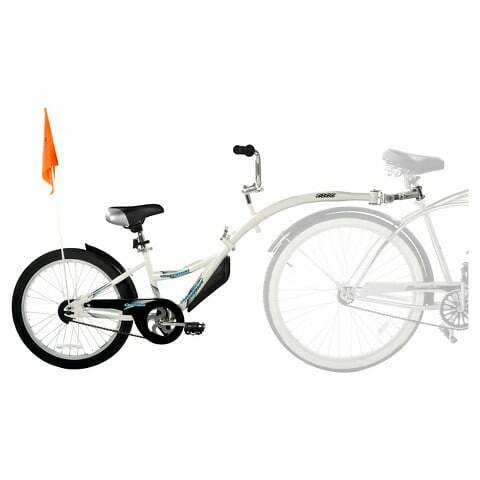 If you've never used one at home but think it might be convenient on vacation, try it out a few times before you leave. 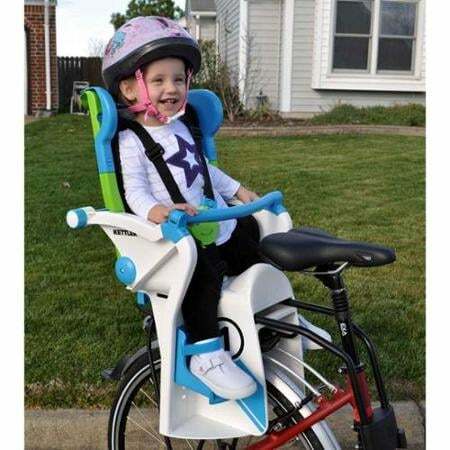 Not all babies will like it, and it might be too hard on your back. 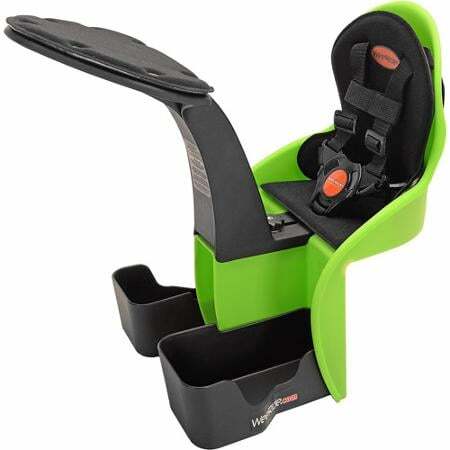 Try taking leisurely drives to check out the area while your baby naps in the car seat. And on some trips, you can coordinate drive time between destinations with sleep time. If your tot isn't an in-transit sleeper, don't be afraid to schedule naps back in the room. While it's a different vacation rhythm than you're probably used to, an a.m. break and midday siesta can be relaxing for you, too. Just consider your baby's napping style when booking accommodations; if you'll need to return to the room often, a hotel near the beach may be a better bet than a spot farther away, even if it's a bit pricier. If you can, book a room with a balcony or patio so the parent "on duty" can enjoy the outdoors, too. If you're bringing a portable travel bed, have your baby sleep in it for a few nights before you leave. That way, it will feel like a familiar, comfy spot to go night-night on vacation. While it can be tempting to throw in the blankie and drive home in the middle of a sleepless vacation night with an inconsolable baby, I implore you to power through. Eventually, babies will adjust to their new surroundings and schedule, and sleep. If you can survive a couple of nights, I am (almost) willing to promise happy vacation days ahead. If bedding down in the same room means no one will get any sleep, consider booking a suite or connecting rooms. A suite may offer the convenience of a kitchen area, but connecting rooms may afford more space at a cheaper price. If your baby's bedtime ritual at home includes a bath, lullabies and a bottle, do the same on vacation to make up for the change in location. Instead of expecting your infant to shift her internal clock and adjust to a new time zone, shift your day: Stay up later or get up earlier than usual by a few hours. Sampling local cuisine and splurging on restaurant meals are vacation pleasures I refuse to give up. Dining with babies can be done. Because our times to swim, hike, shop or visit an aquarium are limited by morning and afternoon naps, it makes sense for the entire family to eat something quick in the hotel room. So we pack plenty of ready-made breakfast foods like mini-bagels, cereal bars and fruit (bananas, apples). If your baby drinks formula, it helps to pack more than you think you'll need. To save space, empty powdered formula into zipper-lock plastic bags. Or order heavy staples like diapers and formula—even baby shampoo—from a site such as diapers.com or Babiestravellite.com that will ship to your destination (and since you won't have to carry the formula, consider splurging on the ready-to-feed type). You can breastfeed anywhere you are legally allowed to be. To enjoy dinners out, you may have to encourage what you would normally consider bad behavior. I don't let my kids watch TV while eating at home, but we always bring portable DVD players when we eat out. Putting on some Sesame Street for them allows us to actually taste the food we're shelling out big bucks for. Sure, a romantic dinner would normally be at 8 p.m., but by dining out at 5:30, you'll likely have an empty restaurant, room to park your stroller, and a short wait for your food. Alternatively, if your newborn loves to sleep in her car seat, make later reservations and then feed her a bottle or nurse her while you wait for your appetizers. Hopefully, she'll be out for the rest of the meal. Now, go enjoy! Toss out all your old ideas about what a vacation should be and embrace the new craziness that is traveling with a baby. Laugh at the fact that you're at the local playground by 6 a.m. and in bed for the night at 8 p.m. 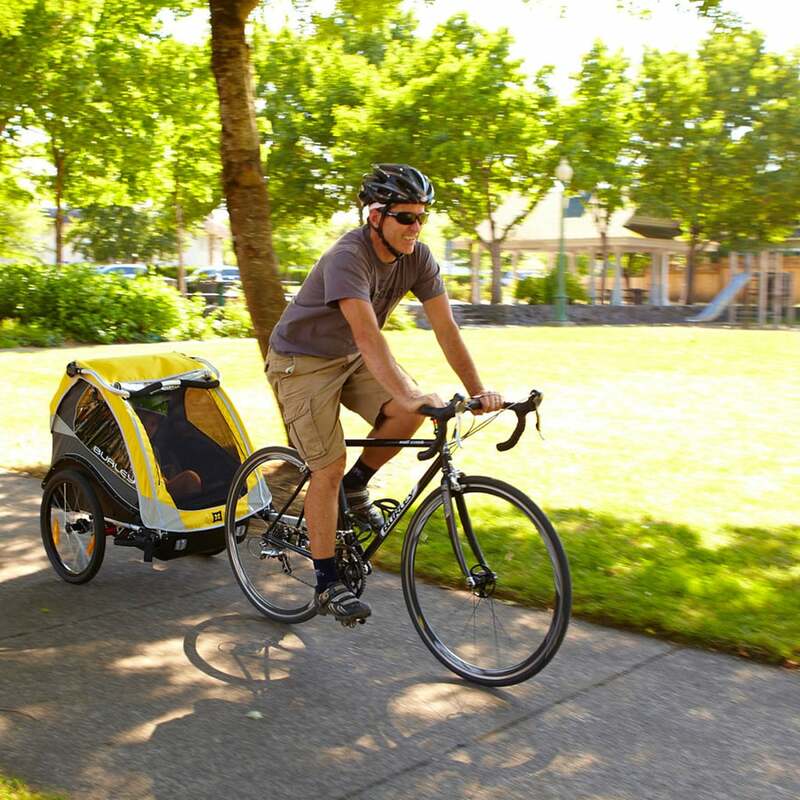 Consider all the gear and baby-lugging as great vacation exercise. And then savor going back home to "regular" life that much more. We've already shared some of the best sunscreens to wear when taking your tot outside, and you already know to cover their eyes with our awesome shades, but what can you do outside other than hanging out by the pool (if you are lucky enough to have access to one)? Pick up some outdoor paint at your local craft store and find some rocks outside to make this adorable little caterpillar! If you're feeling extra crafty, cover the rocks with modge podge to keep the paint from peeling. Get a little messy with this sand slime activity. Instructions here! Get a little competitive with this noodle racetrack DIY. Supplies should cost less than $5, if that! Detailed instructions can be found here. Go bowling...for free! Just grab those soda bottles out of your recycling bin and use an old tennis ball (or any ball really) and you're already 1/2 way there! Bonus points for painted bottles. Get complete instructions here! Release your child's inner Van Gogh with this crafty activity. The best part? I'll bet you a nickel you've already got all the necessary supplies at home. Chalk recipe here! Do you live in a windy city like San Diego? Make these kites and head to the beach where you can show off your one of a kind goodies! Full directions here. How cool is this? Make some with your kids this weekend with instructions here! "All you need is faith, trust, and a little pixie dust!" Or mason jars and some glow sticks...whichever you can grab! For complete instructions, go here! What's better than regular sized dominoes? Giant dominoes of course! If you're like most of us and don't have a saw handy, just use cardboard. Instructions here! And last, but certainly not least, get inspired by this pirate themed party activity here! Thanks again for tuning in and checking out these fun outdoor activities for kids, and enjoy outdoor playtime this summer! Oh, and don't forget to protect your eyes by wearing your ro•sham•bo sunglasses. Slather on the lotion! If you thought the breast vs. bottle debate was polarizing, wait until you talk to fellow playground moms about sunscreen for children. Though lotions and sticks protect little ones' skin from cancer-causing UVA and UVB rays, doctors advise new mamas to use physical barriers — SPF clothing, umbrellas, and shades (like our ro•sham•bo sunglasses!) — rather than lotions on babies younger than 6 months old. Once tots reach the 6-month mark, though, we need to keep them protected from the sun without harming them in other ways. The Environmental Working Group's recommendations for the best sunscreens for tots — products that do not contain potential hormone disruptors — is considered the definitive list of safe options. According to EWG Senior Scientist David Andrews, it's inactive ingredients like retinyl palmitate (vitamin A) and oxybenzone that parents need to look out for. "By and large, the ones that do well in our database are the ones that are mineral-based products with a higher percent of zinc oxide, as well as some of the products with titanium dioxide," he said. While parents have been getting the message about switching from chemical sunscreens for children to mineral versions, one of the group's biggest concerns is how parents are using them. "[Consumers] are looking to buy higher and higher SPF values," Andrews said. "When people use higher SPF values, we're concerned that it leads to a change in behavior and an increased time in the sun and that you apply less of it. Those products may not be as effective in blocking both UVA and UVB radiation. So we steer consumers toward SPF 30 to SPF 50 products and lower and we really think those are the sweet spot of the products that are available in the marketplace." He went on to explain, "The active ingredients in SPF 30 and SPF 100 products may be quite similar. So we're going to be doing more over the course of the next year, investigating the inactive ingredients like the antioxidants and anti-inflammatories that may be reducing redness in the skin, but may not be reducing how much hits your skin. The way the SPF test is done is in changes in skin redness." Steering away from SPF products over 50. SPF 30-50 products depending on the situation are OK.
Seek out products that use three percent avobenzone if they are chemical sunscreens or the ones that use zinc oxide as the active ingredient in natural versions. "[They] do the best job of filtering out UVA radiation across the spectrum of UVA radiation. Seek out products that use a higher percentage of zinc oxide — typically you'll find 15 to 20 percent, or three percent avobenzone." Look at inactive ingredients on the label. If possible, avoid products that use retinyl palmitate (vitamin A) and avoid products using oxybenzone. Avoid spray products — they're convenient but not the best choice. Why skip the convenience of spray lotions? "You don't get a uniform coating on the skin," Andrews says. Plus, "Given the concern about the ingredients in these products, we really don't want to coat the inside of our lungs with sunscreen." 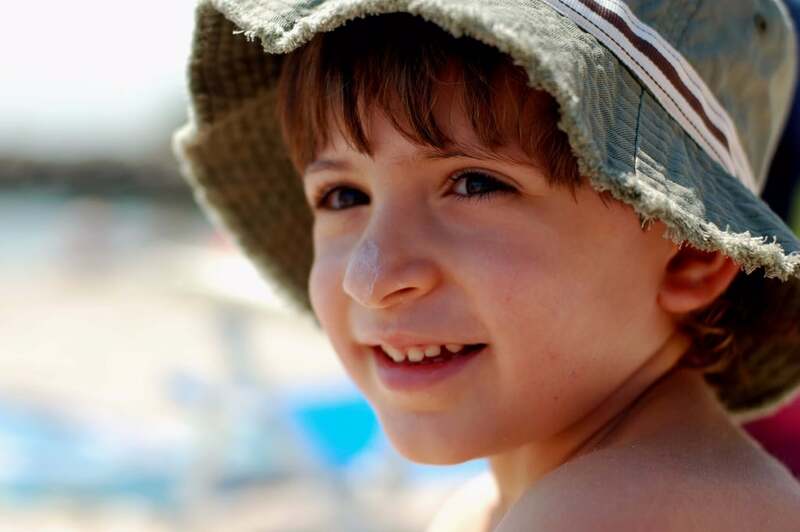 Read through to see these 10 safe sunscreens for kids (many of which can be found at your local drugstore — not just at specialty stores). One of the highest-rated drugstore brand sunscreens on the market, Aveeno Baby Natural Protection Mineral Block Face Stick ($10) is a mineral-based sunscreen using both zinc oxide and titanium dioxide to block the sun's rays. Plus, in stick form, it's easy to apply to squirmy tots and it fits nicely inside a diaper bag. Adorable Baby's zinc-oxide-based Sunscreen Lotion, SPF 30+ ($19) does not use any synthetic ingredients. The formula earns high UVA protection and balance of UVA protection in relation to the SPF on the EWG list. California Baby continues to manufacture safe and effective baby products that won't harm your tots. Its California Baby Super Sensitive Sunscreen, SPF 30+ ($21) is one of the highest rated on the EWG's annual list, due to its 12 percent titanium dioxide formula. A favorite brand of jet-setting moms, Hampton Sun is now gracing the bodies of their little ones thanks to its Hampton Sun Sunscreen Lotion For Baby, SPF 45 ($28). A zinc- (12 percent) and titanium- (six percent) based formula, Hampton Sun's baby lotion receives a high EWG rating due to its good UVA protection and its balance of UVA protection in relation to the SPF. One of the highest-rated sunscreens on the EWG list (it has a low health concern), Badger'sKids Sunscreen Cream ($16) is certified natural, using zinc oxide (18.75 percent) as a blocker and sunflower oil as its base for easy application. Thinkbaby, which was already known for its popular bottles and sippy cups, just received an extremely high rating from the EWG for its Thinksport Kid's Safe Sunscreen SPF 50+ ($10). 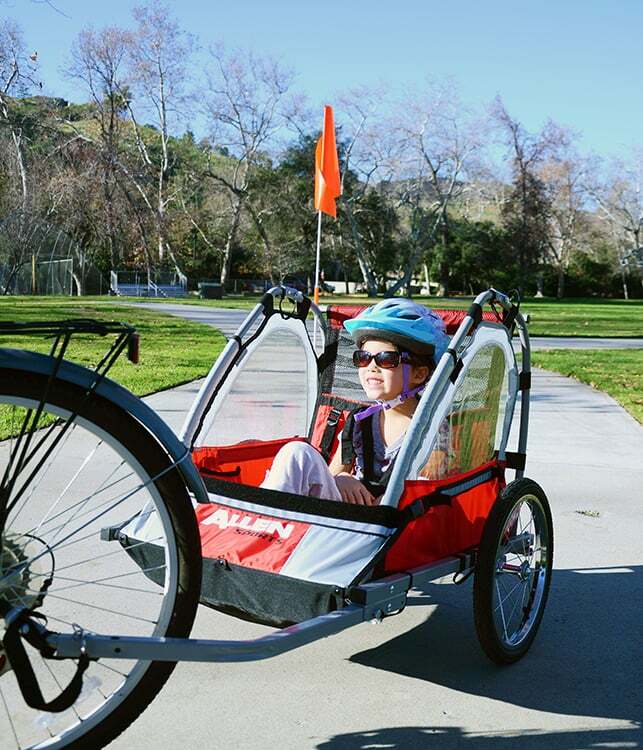 The zinc-oxide-based sun blocker does not contain any nanoparticles, making it safe for babies and big kids alike. A natural, chemical-free sunscreen, Sunology Natural Sunscreen, Kids, SPF 50 ($15) uses a mixture of titanium dioxide (7.5 percent) and zinc oxide (10 percent) to keep skin safe. Thehighly rated lotion is available in a travel size for families on the go. 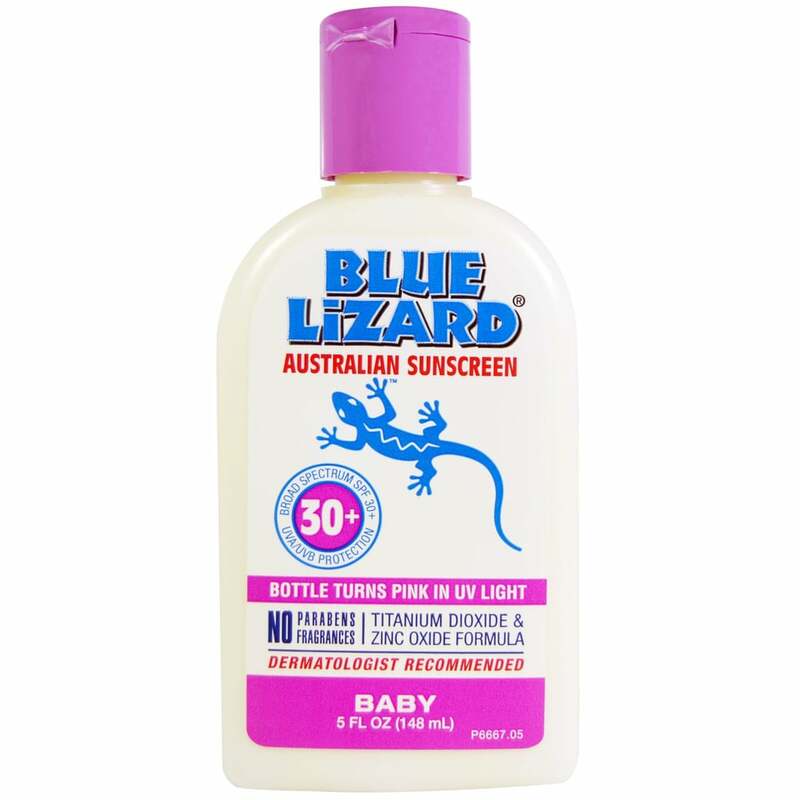 Blue Lizard's Australian Baby Sunscreen SPF 30+ ($19) is made specifically for kids' sensitive skin and uses zinc oxide (10 percent) and titanium oxide (five percent) for sun blockage. It received the EWG's good rating for its UVA protection. 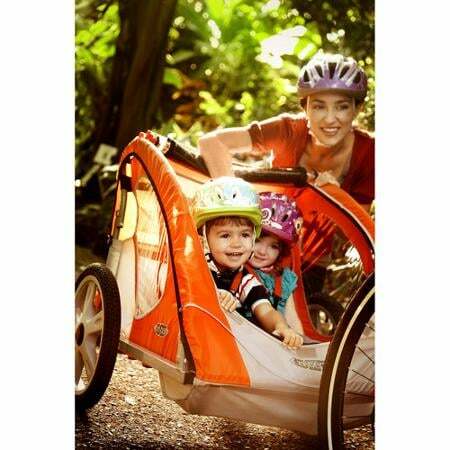 TruKid Sunny Days Mineral All Natural Sunscreen ($19) is quickly becoming a favorite of parents and kids alike. The mineral-based lotion, which uses zinc oxide as its sunblock,received the EWG's highest rating for its nontoxic, nonnano, and gluten-free formula. After a misstep last year, The Honest Company is back with a new sunscreen that not only makes the grade with consumers, but is earning high ratings from the EWG. Their new Honest Mineral Sunscreen, SPF 50+ ($14) is a zinc oxide-based product (19 percent) that provides excellent UVA protection and reportedly has better spreadability than the company's previous iteration. And for what you can't protect with sunscreen, protect with our 100% UVA/B/C baby, junior, and adult sunglasses for the whole family!